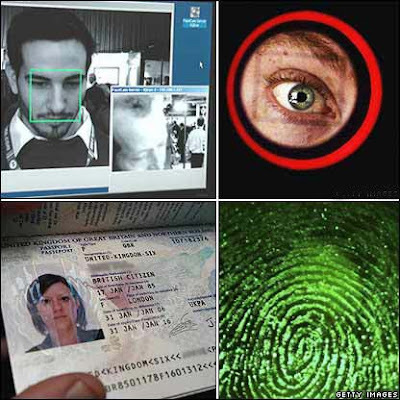 USA biometric passports: We won't be criminals for you! Visa-free visits to US endangered by looming rules! The only looming rules are for fools, giving up personal details to the Devil in the first place, when visiting the US. This security check, fingerprint and photograph will ensure an exploitation bonanza for scapegoats and patsies blamed as terrorists, for the Coalition of the Killings resource war's in the Middle East and for, [war criminal], George Bush. They'll go through you details, arrange them for you, and pick out the best-alleged scapegoat or patsy and accuse them of being a terrorist. Well sorry Bush, but we wouldn't go to the US if you paid us. Same as we wouldn't give out our personal details or photo etc to the loser in the video shop down the road even for a movie. Piss off! I hope those who give up their personal security visiting the US are doing it for necessity? Because if it's corporate greed they seek then the outcome is clear, next time Bush wants to profile a scapegoat or patsy as a terrorist. Come on down or next time it could be you! Officials from the Department of Homeland Security (DHS) said the majority of the 27 "visa waiver" countries - most of which are European but also include Japan and Australia - were unlikely to meet the October 26 deadline for including so-called biometric features, such as digital photographs or fingerprints, in all new passports. "These countries simply, most of them, cannot comply," said James Williams, director of a visitor registration program launched by the DHS on Monday to fingerprint and photograph those arrivals who do require a visa. Some 15.1 million people came into the United States under the visa waiver program last year, accounting for about two-thirds of spending by overseas visitors. Mr Williams said a number of countries, including Britain and Japan, had told DHS they were likely to miss the deadline. Citizens of countries which fail to meet the target would be required to apply for US visas ahead of their travel. This would cause big logistical challenges and industry sources say could cost the US economy billions of dollars in missed travel spending. Mr Williams said Japan had told DHS that 1.5 million Japanese would be forced to apply for advance visas, rather than simply hopping on a plane to the United States. Richard Webster, the director of government affairs at the Travel Industry Association of America, said the October deadline was "unworkable." "The majority of the countries in the visa waiver program are nowhere near being ready to have programs in place to actually issue biometric passports," he said. "That will act as a very firm trade barrier for millions of individuals coming to the US for business and pleasure." He said studies estimated that without the visa waiver system, the United States would lose at least $US10 to $US15 billion in visitor revenue each year. Current US legislation does not allow for exceptions or delays to the deadline, but DHS officials and Mr Webster said Congress would be discussing the problem this year. A US interagency group was also working on resolving the issue. Mr Webster said he knew there would be significant opposition from some members of Congress, but said his group would lobby hard for a legal change. Why is BIT of concern? 1. BIT is not cost-effective for one department to go it alone leading to the potential threat that government would become a single centralised autocratic body. Given that joint officers groups already exist with the Department of Corrective Services and the Department of Police, any regulations limiting access does not meet these concerns. If NSW prisoners only received 2 visitors per year (including family, friends, lawyers, psychologists, housing workers etc. ), there would be computerised records with personal identification marks on about 50 000 NSW citizens each year. In 30 years, that would be the amassing of records on 1.5 million NSW citizens. 2. Privacy protection tends only to exist in the public sector and delivering services or benefits electronically depends on private sector involvement. Despite pre-election commitments to broaden privacy laws to the private sector, the Carr Government have not delivered on this promise. 3. An inevitable feature is some sort of access and identification device. The public anger at the proposed Australia Card shows the extent to which Australians want to protect privacy rights. Privacy International have discussed the areas the BIT industry is strategically targeting, emphasising that prisons or 'captive environments' (eg. refugee detention centres, military complexes) make good testing grounds for the broader applications of this technology. An ATM card under your skin: For sheep and goats? Applied Digital Solutions (ADS) of Palm Beach, Fla., is hoping that Americans can be persuaded to implant RFID chips under their skin to identify themselves when going to a cash machine or in place of using a credit card. They told him don't you ever come around here. Don't wanna see your face, you better disappear. The fire's in their eyes and their words are really clear. So beat it! "Once police have some part of you like DNA, they will look further to profile you whether you're guilty or not. If they find some form of circumstantial evidence [or even flawed circumstantial evidence] to attach to your DNA they will plant the rest of the evidence on you like you had always owned it and you will be convicted and sent to jail guilty or not," he said.